The shortlists for the 2018 Heathrow European Diversity Awards have been released and are available to view at www.europeandiversityawards.com and PWN Global is delighted to be in the running for Charity of the Year, alongside many other worthy causes. 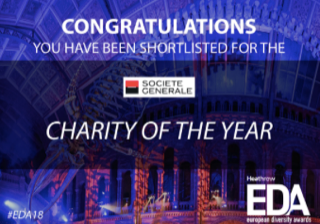 "With so many worthy causes in the world, and so many issues to rectify, PWN Global is truly humbled to take its place in the shortlist for Charity of the Year. Our network supports women around the world to achieve their career aspirations, by working with organisations and individuals to advance gender balance in the world. We are proud that our organization is led and managed by volunteers who are passionate about this cause – our volunteers have personal first-hand experience of the inequalities that still exist in the workplace over 100 years after women secured the vote in the UK. These volunteers work tirelessly to spread the message that gender balanced leadership is not just the right thing to do, it makes excellent business sense too. I know that we are entering a very exciting period in the history of work – as the digital era consumes us, we believe that the playing field for leadership positions could be flattened and women will be enabled to assume their leadership potential alongside their male colleagues. Interested in joining our mission? We’d love to have you on board. Please reach out to me on Twitter, @SonyaR or to @PWNGlobal", Sonya Richardson, Co-President of PWN Global . Now in their ninth year, the European Diversity Awards celebrate those individuals and organisations whose work promotes the values of equality, diversity and inclusion across the continent of Europe. This year’s event is returning to London’s beautiful Natural History Museum on the evening of 29th November, where sponsors and nominees will mingle with business leaders, politicians and media personalities. This year’s shortlists feature global multinationals as well as small community groups and individual campaigners, with around 550 guests expected to attend the glamourous, black-tie dinner and ceremony, where the awards will be presented by actress Sophie Ward. 2017’s winners included David Lammy MP, journalist and presenter Saira Khan, corporate giants eBay and IBM as well as representatives from Adidas and Santander. The European Diversity Awards are headline sponsored by Heathrow. Individual award sponsors are (in alphabetical order) Abercrombie & Fitch, Accenture, Adidas, Coca-Cola, Green Park, HSBC, Just Eat, NatWest, Societe Generale, UnitedHealth Group.